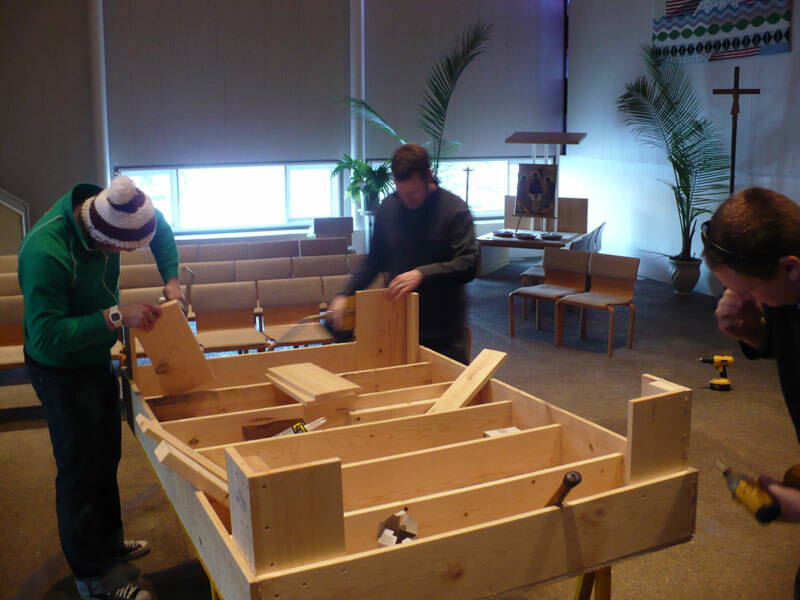 Today was the first day of construction in our new worship space. 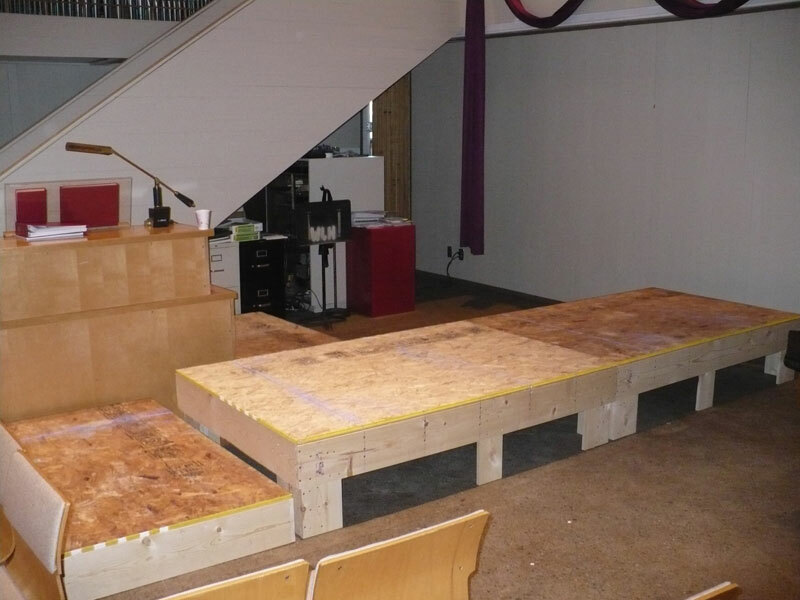 We're not actually building a worship space; however, we do have a few things we need to build. This week, the goal is to have the band platforms, drum cage and tech "booth" (it's really a counter) built. And I don't think we have to build the booth. Today, we started with something easy--stage platforms. I have a love-hate relationship with stage platforms. No, I take that back; it's mostly hate-hate. The stage platforms I've used are heavy, hard to move and heavy. Call me lazy, tell me I'm getting old, but I just don't enjoy lugging 200 pounds of stage platforms all over the place every weekend. I've always known there had to be a better way, and today we got to try to come up with one. Most of the stage platforms I've worked with are made from 2x material as a frame, and topped with 3/4" plywood. I'm a big fan of 2x4's, 2x6's and 2x8's--when I'm building houses. But for stage platforms, I find them overkill; especially for the way we use them. So for these, I took a different tack. We needed 4 platforms; two 4'x6' and two 3'x5'. The larger platforms are 16" high, the smaller ones are 8" high. I reasoned that with proper adhesives and spacing, 1x material would be plenty stiff. So we built them out of 1x8 (the sides and ends) and 1x6 (the center supports, joists if you will). Here's the basic idea. Justin, Jon and Zach are attaching the legs. 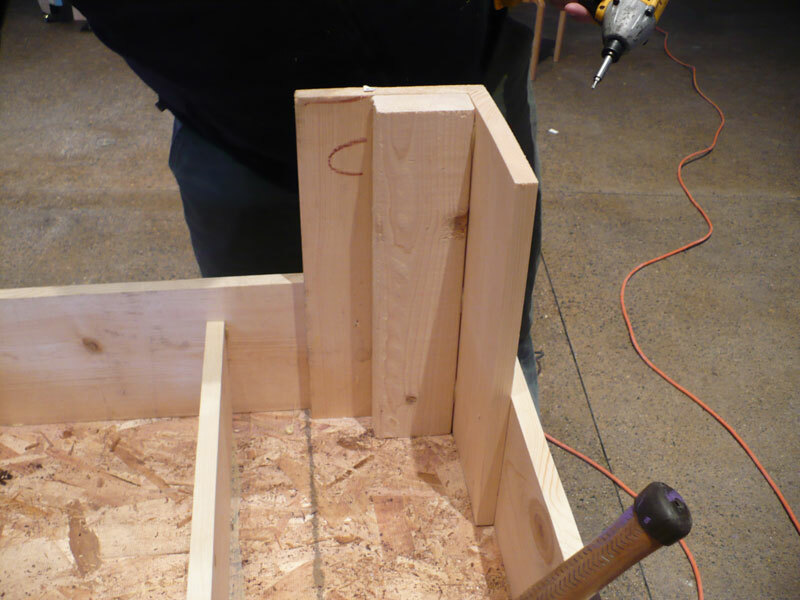 Click to enlarge.I used a biscuit jointer to joint the corners of the 1x8 for some additional strength. We used PL400 adhesive and some really sweet self-drilling screws to tie it all together (after we pinned with a 15 gauge nailer to hold it in place). Perhaps nails, glue, biscuits and screws is overkill--but it is strong! We then used 1x6 spaced 12" on center for the "joists." I went with 1x6's instead of 1x8's figuring that the 6's would have plenty of stiffness when spaced 12" on center, and only spanning 48". These were also glued, nailed and screwed in place. We then fully glued, nailed and screwed 3/4" floor-rated OSB onto the frame. By adding the glue, we made the whole thing a continuous diaphragm that is very stiff. There is excellent load transfer from one joist to the next, and the things don't move at all. The larger platforms are 16" high. I didn't want to go solid sides that high because I figured we'd be edge jointing lumber --that would create a moment of failure unless we did some serious bracing and that would add weight. Remember, I'm old and lazy. So I reasoned that we could create strong corner feet to raise the platform up, and do so without adding a lot of weight. This is what we came up with. Zach driving home some screws. Click to enlarge.I was thinking we would just do the 1x8's, but Jon, our worship director and my co-hort in this adventure, suggested the 2x4 insert. It essentially braces everything and is all, of course, glued, nailed and screwed together. Because we have a full 7 1/4" of connection to the rim joists, and 7 1/4" of projection, I'm not worried about it snapping off; especially with the 2x4 insert. Click to enlarge.If you look closely, you'll notice a center support leg. We didn't really need it; the 4'x6' platforms had almost no bounce even with 2 people on them. But we figured, what the heck. We had left over 1x6, and some glue and screws, so we tacked it on. It really stiffens them up, with minimal weight penatly. Best of all, the smaller ones will stow inside the larger ones for easy storage and transport. So that's day one. Tomorrow we'll start on the drum cage. I'll post pictures when I have them.